There’s not a more amazing place to provide photo booth hire than throughout the Whitsundays. Attending photobooth events in Airlie Beach, Cannonvale, Proserpine, Bowen and beyond really is one of the best jobs in the world! Being just a stones throw from the incredible Hamilton Island, we get to experience world class venues and events every week of the year. Here in the Whitsundays there are unlimited adventures to go on, the Great Barrier Reef is something that you will remember for life, the water is absolutely beautiful here in Winter, perfect blue skies and flat, blue sea… what more could you ask for? If you’re hosting an event and need a sensational photo booth for any occasion, we have you covered. Whether your event is a beach side destination wedding, glamorous school formal, or corporate get together, our Whitsundays photo booth hire will be the life of the party! The bald one and the one with long blonde hair, that’s us – Tim and Norina. 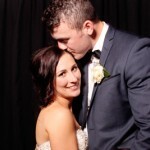 Along with our fantastic team member Sarah-Jane, we take care of Whitsundays photo booth hire. We’re the lucky ones that get to call the Whitsundays home with our tropical coastal town, surrounded by 74 islands and our mainland surrounded by the Coral Sea. Holding your wedding or event here is a real treat for your guests and an experience that they will never forget. Then… throw them “in the photo booth” to add to the fun! It was the laughter and excitement that we saw at weddings and corporate events that first sparked our interest and having met the professional and friendly team behind the scenes we feel our family just doubled (if that’s possible)! On days off in the Whitsundays hmmmm…. Kayaking, fishing, sailing, lazing by the lagoon, island hopping, drinks at our favorite café or restaurant. Okay, we might be showing off a little, but you get the idea. We are looking forward to catching up with you at your wedding day or event for your photo booth hire in the Whitsundays and taking some fun, cheeky and comical photos of you all! Touch base with us today! "We had In the booth at our wedding on the 14th of November over on Hamilton Island at the Yacht Club. The staff were very friendly and professional, our guests loved the booth and we have some amazing pictures to show our children. So a massive thank you for providing such an amazing service with memories I can have forever"
"Hi Norina and crew. It was our absolute pleasure booking with ‘In the Booth’. Our guests loved it and so did we! Added even more to the most perfect day. Jose was fantastic and Norina, you were just incredibly fantastic. Photo booths are a great addition to weddings, so much fun. We are so grateful we decided to have one. Thank you again for everything." What is it you love about providing photo booth hire in the Whitsundays? With the Whitsundays being one of the destination wedding capitals of Australia we have the pleasure of meeting and working with people from all around the country. Our knowledge of the area and our relationships with incredible venues such as Capers on the Esplanade, Coral Sea Resort, The Palm House, The Waterline and Whitsunday Sailing Club means that we are able to support our clients through the process of planning a wedding or event from out of town. The environment in this part of the world is second to none and we have the fortune of ‘working’ with some of the most stunning views surrounding us. How lucky are we? Tell us about some uniquely Whitsundays touches you have seen at an event? We are fortunate to be part of events where the laughter is plentiful and the vibe is relaxed due to the holiday atmosphere of locations such as Airlie Beach. Our clients tend to be folk that love to be themselves and party! The funniest thing we have seen happen at an event is the Bride made her three teenage sons wear Tutu’s on her wedding day – they were her bridesmaids. Everyone including the son’s found it very amusing – they did look cute though! It made for some very memorable photographs! 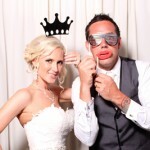 What is the most common question you get asked about photo booth hire in Whitsundays? How many people can you fit in the booth? And what is the maximum you have ever had in the booth? Officially, we say that 8 people can fit comfortably into the booth. Unofficially though, how many you fit depends primarily on how much you value your own personal space! We have seen up to 15-18 people in the booth!! The atmosphere is essential, you want your guests to feel comfortable and enjoy every moment, this can be achieved through music and entertainment at your event. This is why we believe our Photo booths are perfect, it gets all of the guests interacting with one another and essentially “loosens them up”. Many guests can feel uptight upon arrival of an event, a photo booth makes sure the event starts off with laughter. There are so many natural beauties we locals love, one of which is Cedar Creek Falls; it is a natural waterfall with a big round lagoon at the bottom, the perfect spot on a hot sticky day – although beware of our natural wildlife of snakes! Whale watching season is our personal favourite, between the months of June to September it is common to spot Whales and their new born calves frolicking in the pristine water around the Islands, that is something we look forward to after summer every year.